On September 8, thousands of rallies will be held in cities and towns around the world to demand our local leaders commit to building a fossil free world that works for all of us. This collective Rise for Climate, Jobs, and Justice is part of an effort by Peoples Climate Movement to show the world how many people think climate matters. And that we need to elect officials who will take strong, fast action -- or take matters into our own hands. The central initiative featured at our Rise for Community Climate Action will be the Harrisonburg City Sustainability Action Plan. This plan has been under development by the Environmental Performance Standards Advisory Council (EPSAC) for many, many months. The plan calls to create a new sustainability coordinator position in City Council, conduct a Greenhouse Gas Inventory, increase in renewable energy, and set other community priorities for climate resilience. 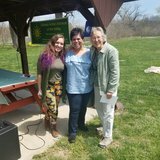 It is being supported in large part by Renew Rocktown, a community coalition dedicated to climate action and resilience in the Harrisonburg area. 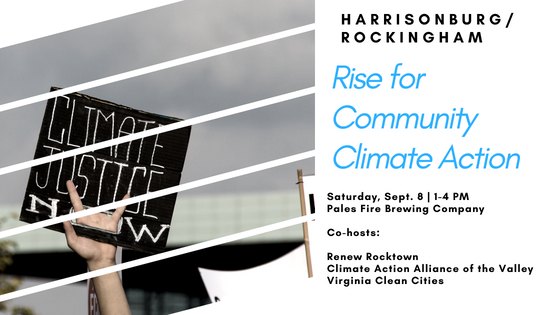 Join us Saturday, September 8th at Pale Fire Brewing Company in downtown Harrisonburg for a fun, informative afternoon of connecting with fellow community organizers and do-ers! You can learn about exciting projects underway by various sustainability and climate resilience allies and find out how to get involved in those efforts that interest you most! Community gardens, pipeline opposition, composting, compost/recycling pick up, restorative justice, organic agriculture, community policing, fossil fuel divestment, fair trade retail and cooperative ownership, waterway management, sustainable transportation, accessible housing, solar power installation -- these are the kinds of solutions that we hope to promote at this event. Please reach out if you are working on introducing or implementing an initiative that you'd like to be featured at this gathering!